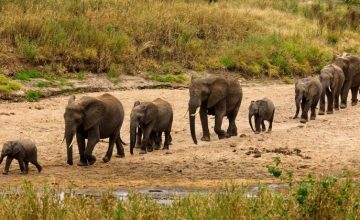 The 12 Days Gorilla & Wildlife Safari in Uganda and Tanzania is a medium safari package starting in Uganda’s Entebe and ending in Tanzania’s Arusha. The main activities include Mountain Gorilla Trekking in Bwindi, Chimpanzee trekking in Kibale National Park, extensive wild game viewing in Queen Elizabeth National Park, Serengeti National Park, Lake Manyara National Park and Ngorongoro Conservation Area including the Big five of African land animals. Following the flight from your country of origin, you land at Entebbe International Airport enjoying the courteous welcome of our representative who might also be your driver guide. After this, you connect to the lodge for relaxation, dinner and overnight. 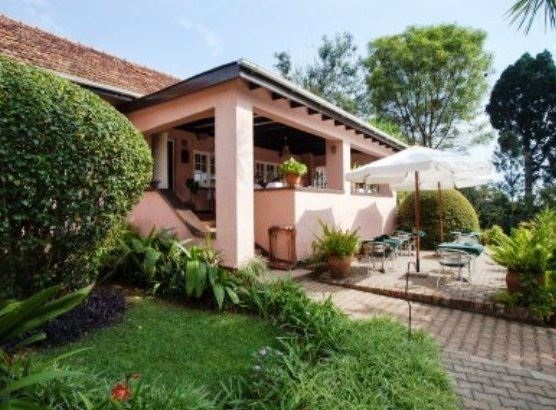 Set off for the drive to Fort Portal 300km around 4 – 5 hours transfer exploring the countryside landscapes marked by lush flora, the inselbergs and extensive tea plantations. You settle for lunch in Fort Portal town after which you visit the Amabere g’Nnyinamwiru Caves – the breast-like features believed locally to be breasts of Nnyinamwiru the daughter of Bukuku a self imposed King of the Bachwezi. The caves have got a seasonal river flowing over them creating scenic water fall. From the caves, you undertake a hike to Fort Portal Crater lake field which is one of the major explosion craters in Uganda. The hike presents impressive adventure and amazing sightseeing opportunities. From the activity, you connect to Kibale for relaxation, dinner and overnight. At 8am, you congregate at Kanyanchu Tourism Centre for briefing about Chimpanzee trekking encounter. 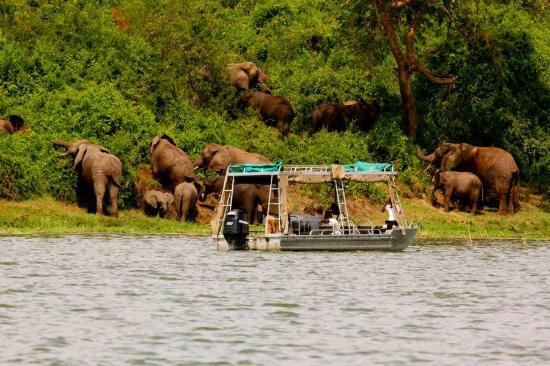 The Uganda Wildlife Authority Park rangers guide you through the lush tropical forest noted to have survived the last ice age and thus with great biodiversity including 375 species of birds, 351 species of trees and 13 primate species. 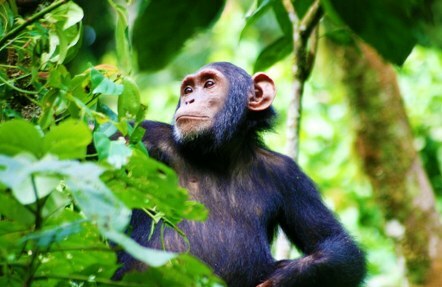 The Chimpanzee trekking experience lasts 2 – 5 hours but for conservation purposes the actual viewing is limited to one hour. The views of Chimpanzees as they forage, much fruit, copulate, patrol, jump from branch to branch and from tree to tree coupled with those of other forest offers like Black and White Colobus monkeys, Red Colobus Monkeys and birds combine to generate ultimate Africa Safari memories. From the trek, you embark on 157km drive about 3 hours to Queen Elizabeth National Park. You set off for the game drive early in the morning around 6am for those that stay inside the park but those outside can only start after the gates open at 7am. 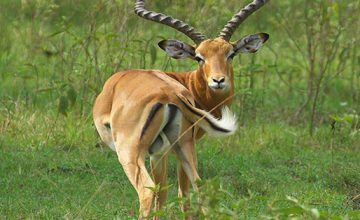 The drive is conducted in Kasenyi plains one of the popular wild game viewing sectors in Queen Elizabeth National Park where possibilities of viewing Elephants, Buffalos, Uganda Kobs, Leopard, Warthogs, Topis, Bushbucks among others. The game drive can last about 3 – 4 hours after which you spend the rest of the time resting at the lodge or keeping with in Mweya peninsular. After lunch, you gather at Mweya jetty on Kazinga Channel for a 2 hour boat cruise enjoying the soothing waters of the channel that connects Lake Gorge and Edward along with the views of the wild game drinking on the channel shore and the aquatics like Nile crocodile and Hippos. From the boat, you undertake a game drive in the Mweya peninsular as you connect back to the lodge for relaxation, dinner and overnight. Set off for the transfer to Bwindi Impenetrable National Park and an en route game drive in the southern sector of Queen Elizabeth National Park offers rewarding possibilities of exploring the unique tree climbing lions that tend to lie on fig tree branches in the mid morning sun. From Ishasha, you proceed on the drive to Bwindi for relaxation, dinner and overnight. Following breakfast at the lodge, you gather at gorilla trekking assembly point for briefing at 8am. The Impenetrable forest of Bwindi perched on a rugged terrain marked by steep hills and narrow valleys present a rather challenging trek than in other gorilla safari destinations. The encounter with the gentle giants encountering them as they forage and socialize is very memorable. Direct viewing is limited to one hour while the whole Mountain Gorilla Trekking encounter can range from 2 – 8 hours. You retreat from the tour and connect to the lodge spending the afternoon at leisure. An optional Batwa Community tour can be arranged in the evening to explore the traditions of these people noted to be among the last surviving groups of short people. Following breakfast, you connect to Kigali International Airport in Rwanda driving through the impressive hillside landscapes of Rwanda that have earned her a dub as the land of a thousand hills. 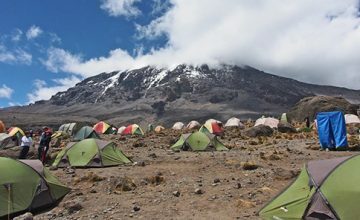 From Kigali, you connect by flight to Kilimanjaro Airport where you will be picked up and transferred to Arusha for overnight. 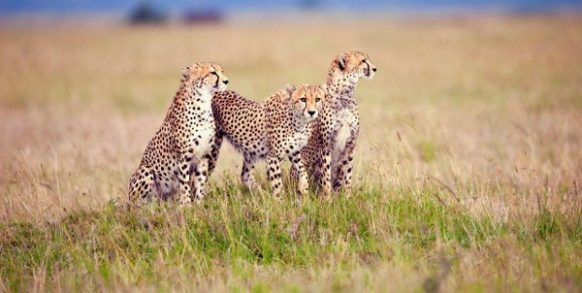 Proceed on the drive to Serengeti National Park which is one of the popular wildlife destinations on the African continent. 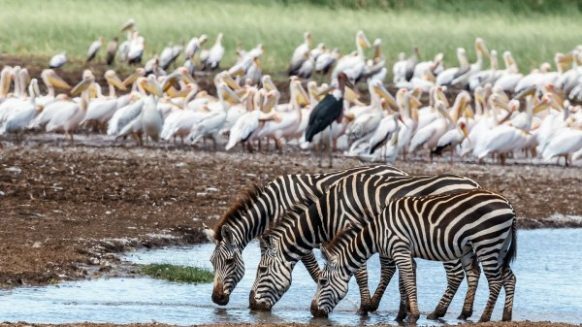 With over 1.5 Million Wildebeest, hundreds of thousands of Zebras, counts of Nile crocodile and honey badger, the Serengeti National Park has a lot to offer generating great African safari memories. You take up a game drive in the evening upon entering the park for extensive wild game viewing experience. After a cup of coffee, you set off for the drive to Ngorongoro Crater exploring the beautiful countryside. You can make an optional stop at Olduvai Gorge – the cradle land of mankind following the discovery of the early man skull by Dr Leakey. 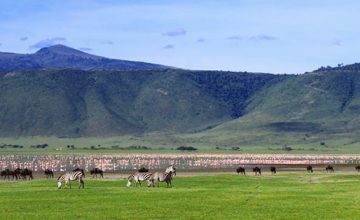 Ngorongoro Crater stands as the World’s largest intact, inactive and unfilled Volcanic Caldera and also a World heritage site as declared by UNESCO. The afternoon is spent on sightseeing and game drive on the crater floor where the possibilities of exploring the Big five including the Black Rhinos exist. You set off from Ngorongoro and transfer to Arusha to mark the end of the safari. From Arusha, you can consider an extension to Zanzibar or take a flight back home.